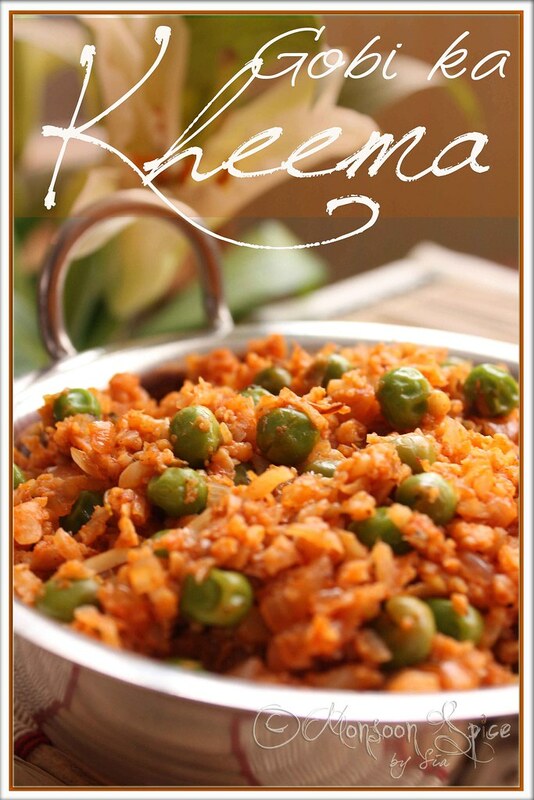 Monsoon Spice | Unveil the Magic of Spices...: Gobi ka Kheema: The art of 'ahem' Seduction!!! Gobi ka Kheema: The art of 'ahem' Seduction!!! Curly haired, little pot bellied, fair and of course handsome! He was there again that night surrounded by his family and friends. I tried to move away from his sight before he could see me and rushed to move past him. But alas, that was not to happen and he was beside me in within few seconds. “Take me home with you tonight” he whispered into my ears. “I don’t think that’s a good idea” I said and tried to move away from him. “Why not? Don’t you fancy me anymore?” he pleaded. “Err, something of that sort” I said without looking into his eyes. “Please tell me, what is it that you don’t like about me is?” he demanded! “Well, there are quite many things I don’t like about you and I don’t think you would like to them in front of your family and friends”, I said. “I don’t care about anything or anyone. All I want is to know the reasons as why you have been avoiding me since last two months! Please, be considerate!” he pleaded again. “OK, if it this is what you want hear!” I took deep breath. “Yes! I am tired of seeing you avoiding me whenever we are in same room and I can’t help but see you favouring that new guy in block!” he said. “I don’t like how inconsiderate you are when it comes to sharing space. Remember last time you came home with me? You occupied so much of space in my tiny home without even considering what others may think or feel!” I blurted. “Oh! I am sorry about that. I will try not to occupy too much of space and be friendly with others from now on” he said trying to hide his smile. “I have never been fond of you. Remember the days when we were kids? You would visit our home at least once a week and make my life miserable as my mother favoured you always?” I said, bit to loudly perhaps. “Is it? I knew your mom was fond of me. I remember her telling one of your aunts how pleasant little boy I am and always doing right! But I never knew you were jealous of me”, he said sounding almost relieved. “I was not jealous! It’s just that you never smelled nice like others. Well, to tell you frankly I think you stink a lot”, I shouted back. “What??? Come again! I stink?” he shouted back. “We stink?” shouted all his family members in chorus, who were eavesdropping all along and pretending to be busy with their own affairs. “Yes, that is the main reason why I have been avoiding you. I tried to like you but your stench that comes from miles makes me run away from you” I told him and his family who didn’t look that friendly anymore. And I took him home that night and yes, he won!!! He wooed me and seduced me that night. He looked good, he tasted better and more importantly he smelled divine! P.S: Before some of you ask, I seriously don’t fancy any curly haired or little pot bellied men ;) So please, don’t start teasing me! Clean the cauliflower and separate it into large florets. Grate them coarsely by hand or using food processor. Next, heat about 1 tbsp of oil in a pan and add grated cauliflower to it. Sauté it on medium flame for 8-10 minutes till they start to turn golden brown. Keep it aside till needed. Heat another tbsp of oil in a pan and add cumin seeds, hing and bay leaves to it. When cumin starts to sizzle and turn golden red in colour, add onion and ginger-garlic paste and stir fry them till raw smell from onions and GG paste disappears and onions turn light golden brown. Reduce the heat and mix in tomato puree. Add chilli powder, garam masala, green peas and salt to taste and mix well. Let the gravy simmer for 2-3 minutes. Mix in sautéed cauliflower and adjust the seasonings. 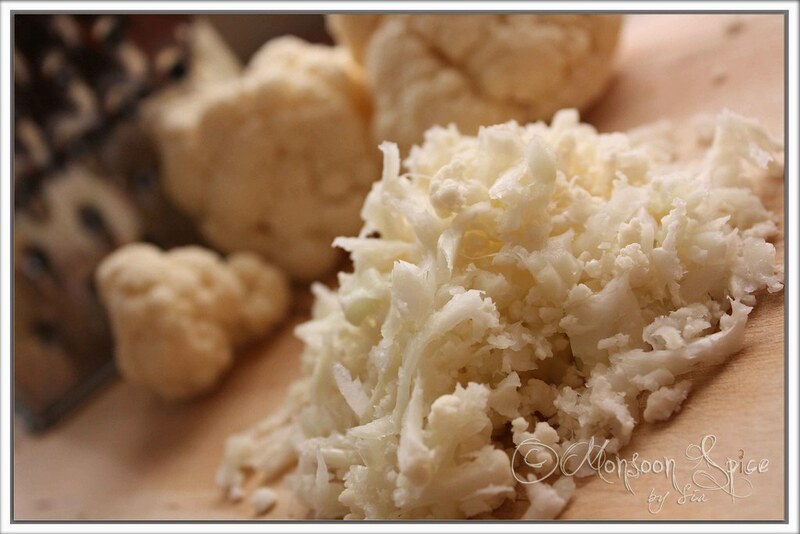 Cook for another 5-7 minutes on reduced heat and ensure that cauliflower is coated well with spices. Serve this delicious Gobi ka Kheema, garnished with finely chopped coriander leaves, with any Indian flat breads or Rotis and enjoy. * You can simply use blanched and pureed tomatoes for this recipe or use this recipe that I made following Ashwini’s recipe for this delicious and aromatic tomato puree. All you need for this Tomato Puree is 3-4 roughly chopped Tomatoes, 2-3 Green Cardamoms, 2-3 Cloves, 1-2 Bay Leaves (Optional), 1 tsp Ginger-Garlic Paste, and 2-3 slit Green Chillies. Place all these ingredients in a stockpot along with 1-2 cups of water and cook it on reduced heat till tomato is reduced to pulp (about 10 minutes). Discard whole spices and green chillies and let it cool. Now either you can mash the pulp and strain the puree into another pan or simply pulse in your food processor. Transfer this puree into a stock pot and add about 1 tbsp Kasuri Methi, salt to taste and little cream if desired and bring it to a gentle boil. That’s it!!! 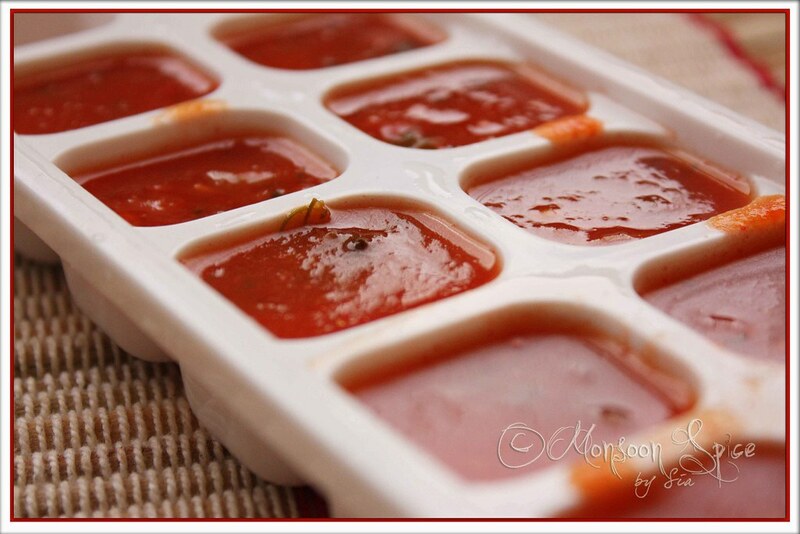 Let it cool and pour it into ice cube moulds and pop them in your freezer. Once frozen, remove from moulds and store it in zip lock bag and use them as and when needed. I have started using them quite a lot in curries, gravies and even I have replaced vegetable stock cubes with this healthy homemade spiced tomato puree. Never had gobi this way, I am tempted to try this recipe. Looks delicious indeed ! Gorgeous Pics!! What? No like gobi?? papa gobi!! The first part was reading a Johanna Lindsey story :) This is a very new dish to me, sounds and looks too delicious! 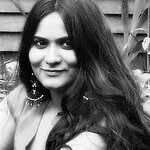 I just started following your blog....but i am getting addicted to it these days. I learn a lot of things from your website. BTW..Just curious, are you trained in photography as well?. Your pictures look really nice. Looks super good.. Nice pics. Loved the recipe and now, your pics are seducing me:) I Have bookmarked this one. :)) Funny story... It was fun to read! The gobi looks really delicious! This dish is so photogenic right? I made this about a year back and posted it and everyone loved the picture. Tell us the truth, i cannot believe u refered the curly hair to gobi! I love the "dead rat smelly veggie" in any form! Looks fabulous! Hey sia looks so good nice read too..it looked like u added rice to it. hahahahha, loved the anecdote ....tell me, you talk to vegetables? and don't deny that you're slightly (no much) fascinated by curly haired, pot bellied, hahahaha, yet fair, (superb choice :) gentlemen, hahaha; and the way you deny it, i think I'm sure you have a small weakness for them :)???? :) this was fun to read... i think i'll also have to give this a try to become a gobi convert!! You make me drool whenever i visit your blog! Delicious recipe! Sia, This is absolutely gorgeous dear...Nice write up, enjoyed reading it buddy..
my to do list of your recipes is growing everyday so yummy I got to try this. Yeah, as Aparna said, you should be writing a romantic novel! I completely got immersed in the conversation. I felt like I am reading a novel. LOL at the conversation. Kudos Sia! Gobi smells funny of course! I don't like it too! But I will try this kheema method. Looks stunningly gorgeous. Yummy. I make this too and I love gobi. No wonder you got seduced! Your kheema looks so much more tastier and spicier than mine! Never thought of making gobi in to Keema! lovely recipe. wanted to thank u for the Khandvi recipe again.. mine got voted for the best recipe. hugs to u! If you don't like gobi, try it frozen. Get a bag of florets, begin by boiling in small amount of water, then let the pot boil a little dry and you'll get the same great 'roasted' aroma and taste. The gobi kheema looks delicious! This is a new recipe to me and I'm definitely going to try it! Enjoyed the narrative. The dish looks absolutely yum!!! Nice to read the story !! 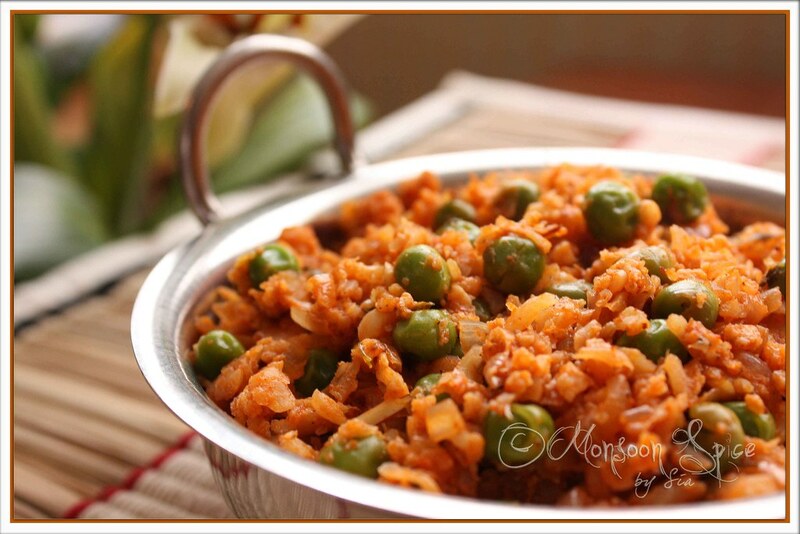 Gobi ka kheema looks so gud with peas, nice combination.. new an shall try !! the tomato puree sounds like a great idea. will try making it when there's place in my freezer. I was wondering where the story was going :) But I love happy endings...so its all good :p Loved the tip about tomato gravy cubes. And the cauliflower dish looks amazing! Sia, so glad you liked the kheema! If it has made you a convert even I am going to look at it differently :) Thanks for letting me know. Hi Sia, Today I made Gobi Kheema Oh! it comes out really good. Just the difference was color I didn't get the bright red color. Probably less chilies..
wow love the Gobi ka Kheema...looks delish! That was a blast from the past..I felt like I was reading Mills n boons! the grated cauliflower subzi sounds delicious. I'll be trying this one out as cauliflower is regular guest in my house. Sia, I tried this kheema today and we all liked it very much. Thank you so much for this awesome recipe. I used your recipe and it came out very well. I have posted my recipe pic on my blog with your site link. Do share more good recipes. Hi, I have to say I've never been that adventurous with cooking cauliflower, but this recipe has me converted! I think the best seal of approval came from my two and a half year old son, who can be a fussy eater and normally takes 20-30 mins to eat his dinner. But when I cooked this for the first time he polished it off within 10 mins in fact he finished his dinner before I had finished mine (which is usually unheard of!). So thank you, for shoeing me how interesting and versatile cauliflower can actually be! OMG!! It took me to the end to realize that you are talking about cauliflower. Hilarious and beautiful. Whole Wheat Naan: For a Healthier Me! 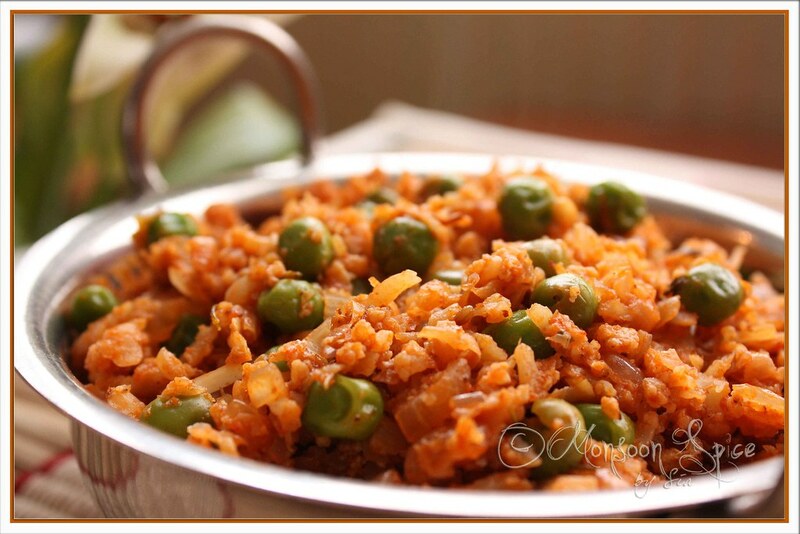 Capsicum Masala Rice: An Ode to Vibrant Spring! Methi-Lilva-Nariyal Pulao: Bitter is Better! Rhengan Reveya: Rural, Rustic Charm!